While the bike course in Barcelona was as fast as is typical for the Spanish course, both the swim and the run have been slower than in previous years. Patrik Nilsson had some mechanical issues on the bike and lost some time, he still managed to go sub-8 and post a new course record. He also posted a new run course record while Johann Ackermann’s 4:12 is a new bike course record. On the female side, Astrid Stienen’s 4:40 was also a new bike course record. 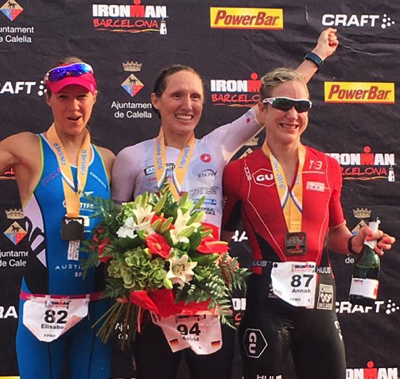 Big smiles on the female podium: Astrid Stienen goes sub-9 and wins her second IM, Lisi Gruber moves up from 3rd last year to second, and Annah Watkinson finishes 3rd setting a new South African Ironman record.